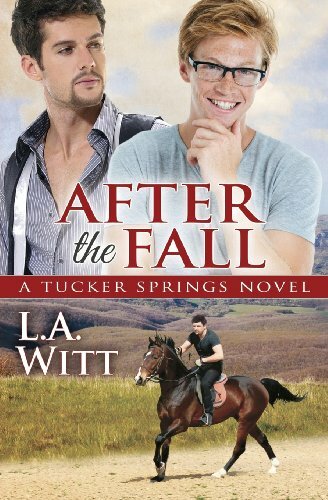 After the Fall L.A. Witt. I love L A Witt and Aleksandr Voinov Market Garden series (Esp Nick and Spencer ) so when I saw this I wanted to read it – and of course its got the bonus of being horse themed and I love horses, and have my own here at home. So Nathan finally gets his dream – his own horse. I well remember that feeling when I’d also worked extra and saved for mine – euphoria. I’d three teens, a full time job and I waitressed at weekends to pay for Sylvester…But poor Nathan is in for a bad time as out on his first ride he runs into Ryan, literally – and ends up with broken leg and hand after Tsarina fell on him. Living seven floors up doesn’t help either – and Nathan hates asking for help. Fortunately Ryan steps in and offers to help with Tsarina if Nathan teaches him to ride..and after checking him out when he sees him again Nathan is only too happy to do just that. He’s had two had breakups, and doesn’t want to get serious again with anyone and Ryan isn’t staying in town for more than a few months…so they should be save, even if he is gay, which Nathan’s not sure of, and even if they do get together, which of course he has no plans to.. But as anyone knows best laid plans and all that 🙂 and the two become closer and closer almost without realising. I recognised some familiar writing style here – when Nathan has this internal dialogue its just like I recall Spencer from the market garden series doing the same. And it works so well, that musing, thinking speech internally, giving yourself a pep talk. One of the reasons it resonates with me is that I do it all the while 🙂 I imagine lots of people do when they are nervous about something – or even the mental rebuke – I didn’t do that right, what was I thinking I should have done/said/tried….or maybe people don’t? I’ll have to ask friends and hope they don’t look at me as if I’ve really lost the plot! Anyway – back to the book, Nathan is a great guy, just wants to get on with his life, have friends, be happy, enjoy his horse and now he’s injured it means time off work, less money, depending on others and not being able to ride for a few months ( been there done that for same reason Nathan. Though it was broken hip in my case – and like him when it was time to get back on it was a terrifying prospect even though I dearly wanted to) so poor guy is really, really down. Then Ryan steps in like the hero he is, and the two just gel together, enjoy each others company and gradually get closer and closer. Then reality steps in, Nathan panics, Ryan isn’t staying, he always travels from place to place, staying a few months here and there – its what he’s always done so what are they doing, and does he want that heartbreak all over again when Ryan leaves? ….and as usual all goes ti ts up! Can they work things out – and how – and what will they do? Its all the usual excellent romance we’ve come to expect from Riptide authors, with tender love scenes and the chaos and heartbreak that come with many relationships. A great read, good story, and realistic setting with an emotional romance keeping things interesting. A bit softer than the best ones, sort of romance lite 🙂 but still another for the keepers file. I can’t yet find it on kindle but am sure it will be there soon. It’s a decent length at 184 pages – as always I really like longer books but this is enough to keep the interest and back a decent story. Stars: four, its a sweet romance but not quite up to the market garden ones.